‘In a show of rare bipartisan agreement, the Senate voted on Monday to begin debate on the bill by huge margin, 94 to 1. More than 15 other House bills, mainly focusing on creating jobs by curbing government regulation, are languishing in the Senate, with little prospect of a floor vote. There were tea parties organized throughout the country for what? Not for helping the nation to get the colossal economic fault line corrected; the rich poor divide is more than ever widened. I bet there shall be two nations with two voices and their language like in the days of Babel shall make understanding the other impossible. The GOP uses language and tactics to stymie the bills from being passed in the House so elderly, veterans and unemployed could be helped. No the GOP had to stick to their guns and they have to make the Obama Presidency one term affair. But how long they can keep it up? Elections are in the offing. These shows how puerile is idea-based party system. As I began politics is the art of making the impossible seem possible. Here is a well known piece of Bob Dylan number quoted by The International Perspective in their blog and fits with my post. Who shall forget the iconic wartime poster depicted Kitchener with finger outstretched: “Your country wants you!” Of an Irish stock he served the British Empire like his counterpart across the Atlantic Pond who was a proconsul,- with ego as oversized as his, served his country. The five star general Douglas MacArthur like an old soldier just faded away after being fired for insubordination; while the British Field- Marshall died in harness and his glory fully restored to him in retrospect. After many years’ experience of commanding relatively small forces in imperial campaigns,of which Khartoum deserves mention here. Kitchener had made his reputation worse by his habit of secrecy, unwillingness to explain his actions to his colleagues, and reluctance to organize and delegate. At the outset of World War I, the Prime Minister, Asquith, quickly had Lord Kitchener appointed Secretary of State for War; Kitchener was by chance briefly in Britain on leave when war was declared. Against cabinet opinion, Kitchener correctly predicted a long war that would last at least three years, require huge new armies to defeat Germany, and suffer huge casualties before the end would come. Kitchener stated that the conflict would plumb the depths of manpower “to the last million.” Unlike the prediction of the German High Command his counsel was borne out to be true. It proved to be serendipitous and triggered Great Britain to step up her war efforts for a long war. His laying the groundwork for the expansion of munitions production and his central role in the raising the fighting spirit of the British army in 1914-15drew criticism. Nevertheless it provided an army capable of meeting Britain’s continental commitment. He was the right soldier for the wrong war that did not prove the cause it set out to win. Then a soldier is only called when clearing politicians’ mess is required. Receiving a commission into the Royal Engineers in 1871 three years later at age 24, Kitchener was assigned by the Palestine Exploration Fund and he undertook mapping -survey of the Holy Land a work that was of great importance. 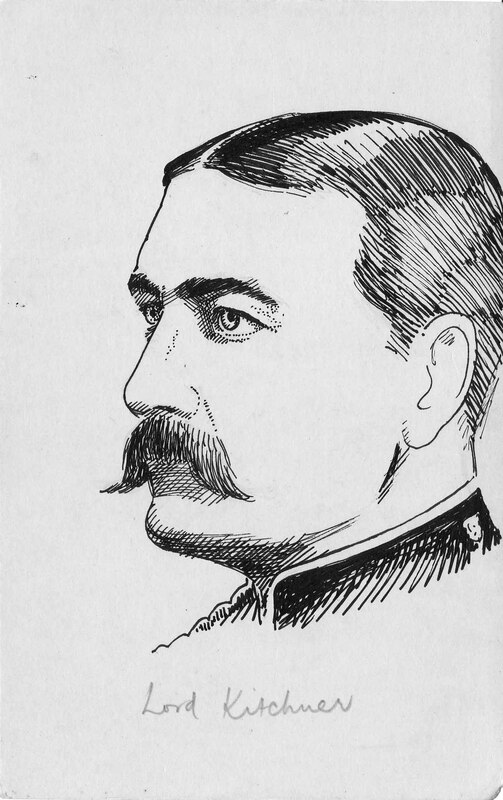 The results of the survey were published in an eight volume series, with Kitchener’s contribution in the first three volumes (Conder and Kitchener 1881–1885). He was noted for his ruthlessness, which was evident in the way he followed Lord Roberts as Chief of Staff (1900–02) in the Second Boer War – by which time Boer forces had taken to guerrilla fighting and British forces imprisoned Boer civilians in concentration camps. His term as Commander-in-Chief (1902–09) of the Army in India saw him quarrel with another eminent proconsul, the Viceroy Lord Curzon of Keddleston who eventually resigned. He aspired to be Viceroy of India, but the Secretary of State for India, John Morley, was not keen probably for his Tory sympathies. The cabinet was predominantly Liberal and they viewed him as Imperialist. Kitchener pushed hard for the Viceroyalty to no avail. He was blamed for the Dardanelles Campaign and shortage of shells in the spring of 1915 – one of the events leading to the formation of a coalition government – and stripped of his control over munitions and strategy. He was criticised by Lloyd George – who may have taken credit for some of Kitchener’s achievements in the field of munitions – in his War Memoirs and by others. He was on a mission to Russia in June 1916 to encourage continued Russian resistance to Germany, his ship, H.M.S. Hampshire struck a German mine off the Orkneys and sank; Kitchener was drowned on 5 June 1916 It was received by the British people with great dismay. JB Priestley recalled in his book Margin Released of his meeting in 1915. I had a close view, finding him older and greyer than the familiar pictures of him. The image I retained was of a rather bloated purplish face and glaring but somehow jellied eyes. A year later, when we heard he had been drowned, I felt no grief, for it did not seem to me that a man had lost his life: I saw only a heavy shape, its face now an idol’s going down and down into the northern sea. yet it was he – and he alone – who had raised us new soldiers out of the ground’.